Through the opening two weekends of the 2016-17 American Hockey League (AHL) season, the Ontario Reign has assumed a familiar position in the Pacific Division standings. The Reign opened defense of its Pacific Division championship by defeating the host San Diego Gulls 2-0 in its season opener on Oct. 15 and then tipped the visiting Texas Stars 6-5 in an overtime match-up on Oct. 21 to face off Opening Weekend at Citizens Business Bank Arena. The L.A. Kings AHL affiliate then picked up an important standings point in a 5-4 overtime loss to the visiting San Jose Barracuda on Oct. 22 to extend its record to 2-0-1 and in the process, join the Stockton Heat atop the division standings with identical .833 winning percentages. The Reign, 2015 Calder Cup champions, won two playoff series before being derailed by the eventual 2016 Calder Cup champion Lake Erie Monsters in the Western Conference Finals. The reigning Pacific Division champions looked every bit as strong as last season in shutting down the archrival Gulls in its season opener in San Diego. Reign head coach Mike Stothers said he liked what he saw from his team in its first outing in 2016-17. 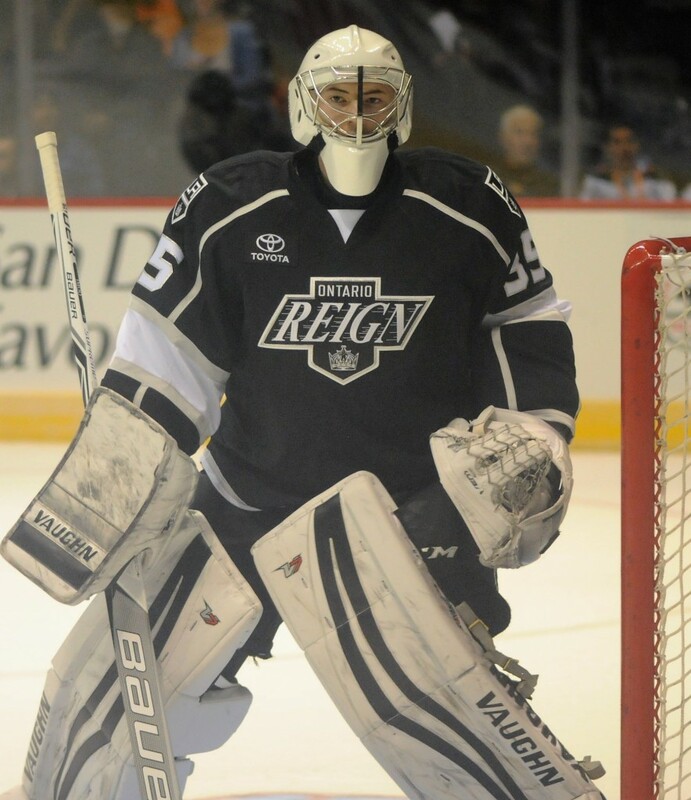 The Reign won 44 regular-season games last season and tacked on seven more wins in the playoffs. What does Stothers see in this season’s group? The Gulls finished 20-10-4 on their home ice last season and defeated Ontario in eight of 12 regular season games overall in 2015-16. But the Reign held the upper hand in the renewal of the teams’ intense Southern California rivalry. Ontario used a pair of second period power play goals – one each from newcomer T.J. Hensick and returner Michael Mersch – and rode a 36-save performance by goaltender Jack Campbell to defeat host San Diego in the teams’ first meeting since last season’s Pacific Division Finals. Special teams proved huge in the outcome of the contest as Campbell and the Reign defense held the Gulls scoreless in six man-advantage situations. The win was impressive in another way for Ontario as the reigning division champions were without the services of last season’s AHL outstanding goaltender Peter Budaj, who received a last-minute call-up to the parent NHL Los Angeles Kings. Ontario out-shot San Diego 23-19 during the opening two periods. However, the Gulls applied the pressure in the third period with a 17-4 shot advantage to finish with a 36-27 edge in shots in the game. Included in the flurry were shots off the crossbar by San Diego’s Stefan Noesen and off the post by Stu Bickel. Campbell (shutout win) earned first star billing while Ontario teammate Sean Backman (two assists) received second star recognition. Jonny Brodzinski also collected two assists in the game for the visitors. Matt Hackett made 25 saves on 27 shots to absorb the loss in his first start of the season for San Diego. Brodzinski scored 56 seconds into the extra sudden-victory period to lift the Reign to the OT win over the Stars (2-1-1) and a 2-0 start to the season. Ontario blew out to a 4-1 lead after the first period but was outscored 4-1 over the next to periods as the regulation portion of the game ended in a 5-5 draw. Kevin Gravel and Adrian Kempe drew assists on Brodzinski’s game winner, while Vincent LoVerde earned first star of the game for the Reign with two goals and one assist. Zach Leslie scored the game’s jump goal for Ontario, followed by two goals by LoVerde and Hensick’s second goal of the season, to boost the hosts to an early three-goal advantage. Mersch notched his second goal of the season late in the second period to give Ontario a 5-3 lead. 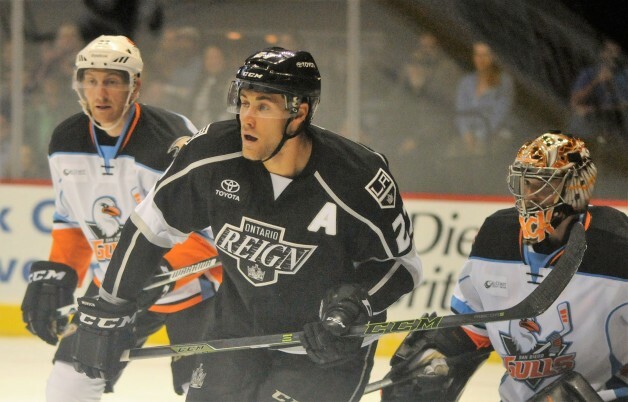 The Reign recorded three power play goals and one short-handed goal in the victory. Campbell stopped 30 shots to pick up his second win in as many starts to cheers from the 7,861 in attendance. The Oct. 22 game earned a place in pro hockey history for Ontario goaltenders Jonah and Dusty Imoo as the first father-son goaltender tandem to play in a game. Father backed up son due to call-ups to both Budaj and Campbell to the Kings. Jonah Imoo, 22, attended the Reign’s preseason development and training camp. Dusty Imoo, 46, serves as the team’s goaltender development coach. The unusual set of circumstances was set in motion when Campbell was called up to the Kings following an injury to Jeff Zatkoff. Budaj had been called up to the Kings the previous week following an injury to Kings starter Jonathan Quick, with Campbell promoted to the starting position with the Reign and the younger Imoo returning to the team as Campbell’s back-up for the season opener in San Diego. The elder Imoo, who represented Japan at the 1998 Winter Olympics, has been coaching since 2008, including the last two seasons in the Kings organization. It wasn’t uncommon for him to don pads for Reign practices. “I bet I was more nervous than he was,” Dusty Imoo quipped before the game about the storybook scenario for father and son, further terming it a “once-in-a-lifetime” opportunity. Both father and son signed PTO contracts with Ontario. When Quick was sidelined, Jonah Imoo was signed to a 25-game AHL PTO contract on Oct. 20. Dusty Imoo was brought on as an emergency goaltender. Jonah Imoo got the start against the Barracuda. He stopped 26 of 31 shots in his professional debut. Dusty was on the Ontario bench, ready if needed. The game ended when Daniel O’Reagan netted the game-winning goal on a breakaway 3:29 into the five-minute sudden-death overtime period. The younger Imoo, who admitted he had been waiting for this opportunity for some time, called the game “intense.” Watching his every move was a near capacity crowd of 8,282 at Citizens Business Bank Arena. Dusty Imoo said both goaltenders approached the history-making moment in a “business-like” manner in order not to get too caught up emotionally. But father had to fight back tears nonetheless in watching his son make the jump to the next level. The Barracuda (1-1) out-shot the Reign 31-15 in the game, including 4-0 in overtime. Brett Sutter, son of L.A. Kings head coach Darryl Sutter and the eighth member of the famous Sutter family to play in the NHL, scored his first goal in an Ontario uniform. Ontario center Patrick Bjorkstrand scored a pair of power-play goals and added an assist to earn top star honors. San Jose’s Nikolay Goldobin was named the game’s second star with one goal and two assists. Andrew Crescenzi also scored his first goal of the season for the Reign. Each team scored once in the first period before the floodgates opened with five goals in the second period, including three by the Barracuda. The win was the 649th in regular season play for veteran San Jose head coach Roy Sommer, the winningest coach in AHL history. The Oakland native leads all active league coaches in career games on the bench as well. The game marked the first meeting of the teams since last season’s Pacific Division semifinals when the Reign eliminated the Barracuda three games to one. Stockton finished sixth out of seven teams in last season’s division standings, so the strong start out of the gate in 2016-17 is especially noteworthy for the Heat, the AHL affiliate of the NHL Calgary Flames. Stockton defeated visiting San Jose 3-2 in the Pacific Division season opener for both teams on Oct. 15. Matt Frattin, Hunter Shinkaruk and Ryan Lomberg scored for Stockton, while O’Reagan and Barclay Goodrow scored for San Jose. Lomberg received first star honors for scoring the game-winning goal in front of 5,745 fans at Stockton Arena. The Heat continued its hot hand by dealing visiting Texas a 5-1 defeat on Oct. 19. Shinkaruk, Morgan Klimchuk and Andrew Mangiapane swept three star honors each with a goal and assist and goaltender Jon Gillies stopped 29 of 30 shots. Stockton closed out its three-game home stand with a 2-1 overtime loss to the Tucson Roadrunners, the Pacific Division’s newest member, on Oct. 21. The Heat picked up five out of a possible six standings points to face off the season. San Diego faced off its opening weekend with a 5-3 victory against the Roadrunners in front of 10,727 on Oct. 14. The teams combined for five power-play goals – three by the visitors and two by the hosts. Corey Tropp earned first star honors for the victorious Gulls with one goal and two assists, while Antoine Laganiere received second star recognition by scoring two clutch third period goals. Mike Sgarbossa and Kalle Kossila rounded out the San Diego goal scoring. Dustin Tokarski got the start in the Gulls net to face off the new season, finishing the game with 29 saves. San Diego out-shot Tucson 43-32. Bakersfield earned a split in its two-game road trip to Winnipeg to face the host Manitoba Moose. The Condors scored the opening goal and never trailed in posting a 4-1 victory in the first game played on Oct. 18. Center Jujhar Khaira scored two goals and goaltender Nick Ellis made 30 saves in his professional debut. It looked like Bakersfield might sweep the two-game set on Canadian soil after building a 3-2 lead through two periods, but the Moose outscored the visiting Condors 3-1 in the final period to skate off the ice with a 5-4 victory. Matt Benning, Joey Benik, Jere Sallinen and Khaira each scored single goals, while Ellis made 32 saves on 36 shots faced in the setback for Bakersfield. 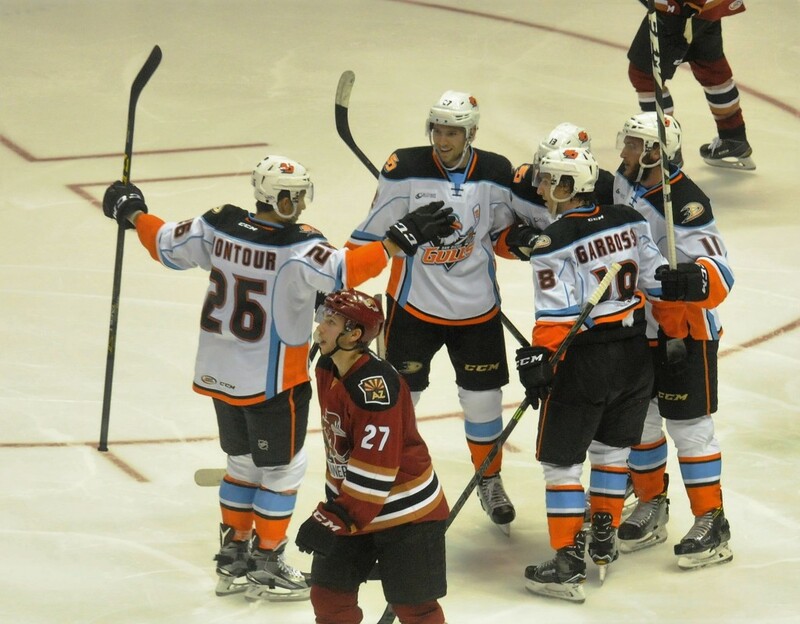 Tucson edged Bakersfield, 2-1, to spoil the Condors’ home opener on Oct. 22 in front of 6,045 fans at Rabobank Arena. Scott Allen (second star) tied the game for Bakersfield midway through the third period, but Eric Selleck (top star) tallied what proved to be the game-winner for the Roadrunners with 5:29 to play. Bakersfield dropped to 1-2 while the Roadrunners improved to 2-1. Condors goaltender Laurent Brossoit, recently assigned to Bakersfield by Edmonton, stopped 23 of 25 shots to earn third star honors. Tucson picked up its first win in franchise history in come-from-behind fashion as Stockton concluded its three-game homestand. Brandon Bollig gave the Heat a 1-0 lead before the Roadrunners netted the game’s final two goals. Brendan Perlini notched the OT winner for Tucson off assists from Kyle Wood and Ryan MacInnis after Craig Cunningham had deadlocked the score 1-1 with his third goal of the season early in the third period. Marek Langhamer got the win for the Roadrunners by making 43 saves as Tucson (1-1) was out-shot 44-30 by Stockton. San Diego will conclude its season-opening four-game home stand with an Oct. 26 game against the Heat. The Gulls improved to 2-1 on the season following a tense 5-4 win over Texas on Oct. 22. San Diego, playing without three regulars – defenseman Shea Theodore, left wing Joseph Cramarossa and Sgarbossa – called up to the NHL Anaheim Ducks, received goals from Kevin Roy, Brandon Montour, Nick Tarnasky, Laganiere and Bickel. San Diego appeared to have a comfortable 3-1 lead before the Stars reeled off three consecutive goals in a 4:45 span to take a 4-3 lead. The Gulls promptly retaliated with goals 23 seconds apart from Laganiere (his team-leading third of the season) and Bickel. Tokarksi (25 saves) picked up his second win in as many outings. Budaj was recalled by the Kings on Oct. 14 and promptly hit the ice in the NHL with much fanfare. He entered the Kings’ game against Minnesota on Oct. 18 in relief of Zatkoff. Budaj stopped all nine shots he faced in the third period in a 6-3 loss to the Wild. Budaj got the start in the Kings’ next game Oct. 20 in Dallas and stopped 17 of 30 shots he faced in a 4-3 overtime win over the Stars. It marked the Kings’ first win of the season after opening with three losses. Budaj picked up his second win in as many starts for the Kings (2-3) in a 4-3 shootout victory against visiting Vancouver on Oct. 22. Budaj made saves on Sven Baertschi and Brandon Sutter in the shootout tiebreaker after making 22 saves in regulation and overtime in his 300th NHL game. It was the first loss of the season for Vancouver (4-0-1). 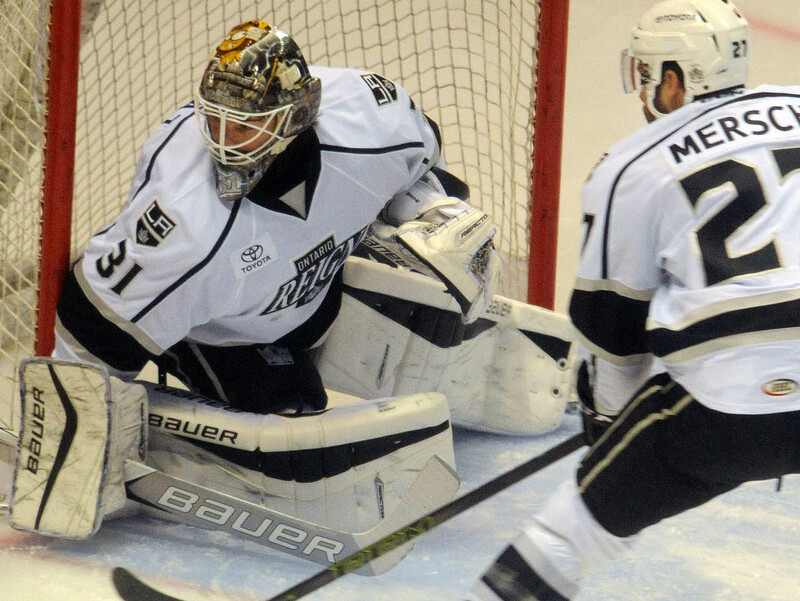 Budaj got the call-up to the Kings when Quick sustained a lower body injury. Quick, who was placed on injured reserve, is expected to be sidelined up to three months. Through two weekends of play, Texas center Justin Dowling led the Pacific Division in scoring with eight points (two goals, six assists). Next in line were Wood with six points (one goal, five assists), Texas left wings Brandon DeFazio and Cole Ully, each with five points (three goals, two assists), and Texas defenseman Andrew Bodnarchuk, also with five points (two goals, three assists). Tropp led players on the division’s five California teams with five points (one goal, four assists) while Khaira had collected four points (three goals, one assist) in three games. Top goaltenders included the Tucson tandem of Langhamer (0.95 GAA, .977 save percentage) and Adin Hill (1.00 GAA, .969 save percentage), Gillies (1.64 GAA, .944 save percentage), Campbell (2.48 GAA, 0.930 save percentage) and Ellis (2.53 GAA, .925 save percentage). Prior to the start of the season, the majority of San Diego players, along with the Gulls head coach and team president of business operations Matt Savant, participated in the YWCA of San Diego’s Walk a Mile in Her Shoes event on Oct. 11 that saw participants walk a mile in women’s heels to support domestic violence awareness. The Gulls’ Oct. 22 game also was denoted as Domestic Violence Awareness Night to commemorate Domestic Violence Awareness Month. “Very proud of our men today. Invested their time on a day off to bring awareness to domestic violence,” Eakins posted on his Twitter account. Gulls players Brian Cooper, Nate Guenin, Jaycob Megna and Tarnasky subsequently paid a visit to Rady’s Children’s Hospital to pass out stuffed animals and make new friends. “Very proud of our men when they invest their time away from the rink having a positive effect, influence on others,” Eakins tweeted. The AHL faced off its 81st season with five franchises averaging more than 8,000 fans per game in attendance and 11 franchises averaging more than 6,000 fans. San Diego, which finished second in last season’s attendance derby, had averaged 8,712 fans in its first three games this season to rank third among the league’s 30 teams, while Ontario averaged 8,072 for its opening two home games and Stockton averaged 3,899 for its opening three home games. Bakersfield drew 6,045 for its home opener. San Jose and Tucson both have their home openers scheduled for Oct. 28.